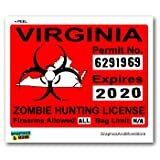 247 Skins Zombie Hunting Permits are made from Durable Triple layer Sticker material with a Crystal clear Over Laminate. Please don't confuse these with cheap, paper thin stickers manufactured by several home printers and sign companies. Permits are Easily removable without leaving a sticky residue. These decals are very Easy to install, have Vibrant Color and High definition detail. They are 5 year UV Resistant & Fade proof.